It’s my favorite way to celebrate the start of the summer. Now that the tiring, hard work of finishing up a school year is over, I can sit back, relax, and explore/connect/create (Hmmm… sounds very essential competency-ish). Honestly, I’m giddy with excitement for the next few days. 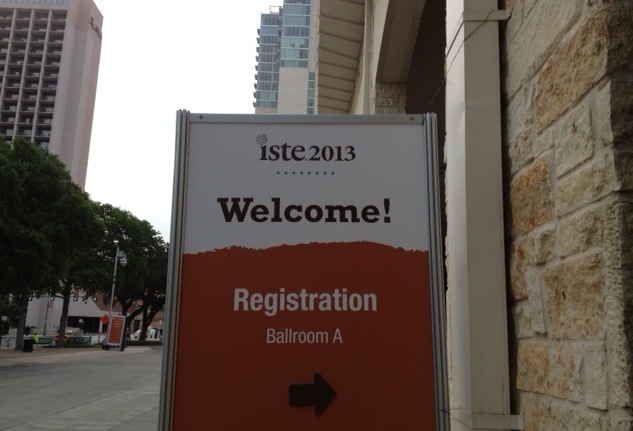 I remember my first ISTE in Denver. Thanks to Angela (then MS Tech Coordinator) I attended with several other teachers from OES whom I would later work closely with (Brad, Gomes, Jeffrey, Lara). I had a tough first year in Portland personally and professionally (never underestimate East to West Coast culture shock) and was really questioning where I should be, what I should do. I found myself in the midst of teachers excited about education and all these amazing tools that could really help connect with students. I learned about Google Apps, Twitter, SMART boards, to name a few. Attending that conference probably kept me in teaching. San Diego last year was different because I was now the tech coordinator and the one responsible for bringing other teachers with me. I also narrowed my focus, concentrating on gaming and professional development. My most memorable sessions were playing WoW with Peggy Sheehy, learning to program in Scratch and AgentSheets, and connecting with current and former colleagues. This year I’m here again in a few different roles. Several of my colleagues are here and I’m excited for the conversation it always generates. I’m presenting a poster Tuesday 4-6pm on my work with SimCity. I have been selected for the SIGIS (Special Interest Group: Independent Schools) Executive Committee, so I’ll be at the Meet & Greet Sunday 3-5pm and the Yearly Meeting Monday 8:30-9:30am. I’m excited for this chance to volunteer with ISTE, connect with more independent school techies, and work to support others. How will I organize myself? What are my goals for these 4 days? Be where I am. Don’t try to be everywhere at once and don’t over commit. Stop and have conversations with people rather than running off to something else. Gaming. I’m hopeful for several gaming-type initiatives at our school so I want to continue to find ways to talk about it with kids, teachers, and administration. Support. Three out of four of our middle school arts teachers are here to learn about integrating tech into their classroom, particularly with stop motion animation projects. I want to hear about what they learn and what they need from me in terms of support. This is important to me because people often go to conferences and get energized while they’re there, but then lost momentum when they return. Reflect. Blogging about recaps, highlights, special moments. While I can’t promise 1 post per session, at least once per day. Let the fun work begin!